HARVEY was born in Havana (Cuba, 1974) and graduated in Physics at the University of Havana (Cuba) in 1997. 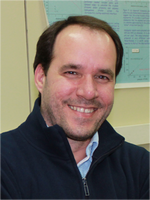 His research career started with the achievement of the MSc degree, also in Physics, at the University of Havana (Cuba) in 1999, then moved to Portugal in 2001 and earned his PhD in Materials Science and Engineering at the University of Aveiro (Portugal) in 2005. He joined the Spanish system for Science and Technology in 2006, followed by research positions at the Instituto de Ciencia de Materiales de Madrid (ICMM) of the Spanish National Research Council (CSIC), including research Fellowships of the Spanish Juan de La Cierva and Ramón y Cajal Programmes. He has recently got a Tenured Scientist position also at ICMM-CSIC from 2017. Multiferroics; Magnetoelectrics; Ferroelectrics; Piezoelectrics; Perovskite; Morphotropic phase boundary; Ceramics; Thin-films; Composites; Mechanosynthesis; SPS; Nanostructuring; Sensors; Actuators; Energy Harvesting. Tenured Scientist, Consejo Superior de Investigaciones Científicas, from 2017. Researcher, Instituto de Ciencia de Materiales de Madrid – CSIC, from 2015 to 2016. Research Fellow (Spanish Ramón y Cajal Programme), Instituto de Ciencia de Materiales de Madrid – CSIC, from 2009 to 2014. Postdoctoral Fellow (Spanish Juan de La Cierva Programme), Instituto de Ciencia de Materiales de Madrid – CSIC, from 2006 to 2008. PhD in Materials Science and Engineering, Department of Materials and Ceramic Engineering, University of Aveiro, Portugal, from 2001 to 2005. MSc in Physics, Physics Faculty, University of Havana, Cuba, 1999. Degree in Physics, Physics Faculty, University of Havana, Cuba, 1997. Organizer of II Young Scientist Meetings at ICMM-CSIC, 2015-2016. Organizer of Line Seminars: Materials for Information Technologies, ICMM-CSIC, since 2009. Evaluator of the Research and Professional Activity of the Institutes of the Czech Academy of Sciences for 2010-2014, Czech Republic, 2015. Prize of International Advisory Committee, COST Action MP0904 (Best Success Story) 2014. Substitute Member of the Management Committee, COST Action MP0904 “Single- and multiphase ferroics and multiferroics with restricted geometries” SIMUFER, 2010-2014. National Prize of the Academy of Sciences (Cuba), Transport properties in electroceramic materials. Guerrero, Y. Leyet, J. de los Santos, J. Pérez & H. Amorín, 2012. National Prize of the Academy of Sciences (Cuba), New relaxor-ferroelectric materials. Portelles, S. García, F. Guerrero, H. Amorín et al., 2005. Prize Alma Mater for Best Young Researcher, University of Havana, Cuba, 2000. Regular Reviewer in International scientific journals: Nature Communications, Scientific Report, Applied Physics Letters, Physical Review B, ACS Appl. Mater. Interfaces, J. Am. Ceram. Soc., J. Eur. Ceram. Soc., J. Phys. D: Appl. Phys., J. Appl. , etc. 2012-2016 Co-supervisor of PhD Student: Carmen M. Fernández-Posada, Novel multiferroic magnetoelectric materials from the Bix+yPb1-x-yFexMnyTi1-x-yO3 ternary system along the line of morphotropic phase boundaries, Faculty of Science, Autonomous University of Madrid. 2012-2014 Co-supervisor of 3 MSc Students: Rubén del Campo (2012); Eider Berganza (2013); Cristina Pascual (2014), Faculty of Science, Autonomous University of Madrid. 2000 Co-supervisor of BSc Diploma in Physics: Michel Venet, University of Havana, Cuba. Member of Advisory Board of 5 PhD Dissertations: Marco Aurélio Pinto, University of Minho, Portugal (2015); Armando Janier Pérez, Autonomous University of Madrid (2015); Claudia Sofia Lehmann, University of Minho, Portugal (2015); Covadonga Correas, Autonomous University of Madrid (2014); Yonny Romaguera-Barcelay, University of Porto, Portugal (2012).